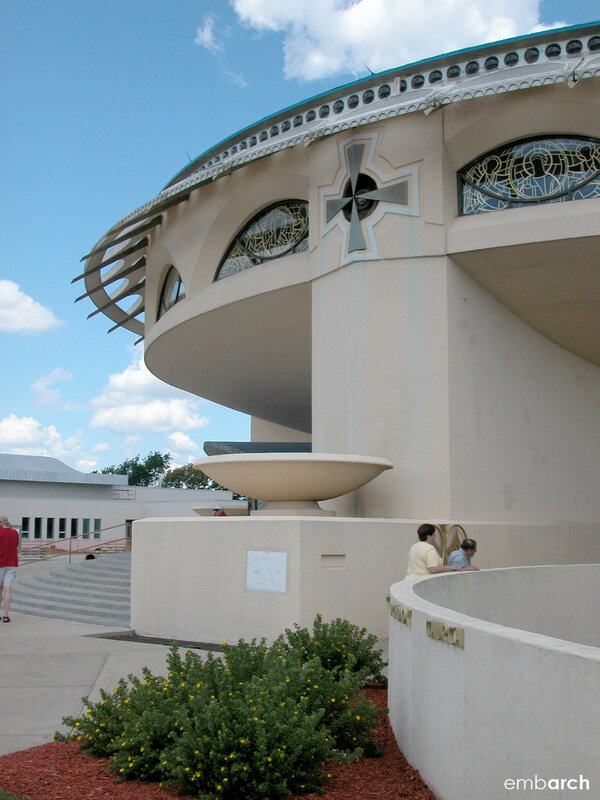 The departure point for the shape of the Annunciation Greek Orthodox Church has been said to be the Greek cross inscribed in a circle; however, many of Frank Lloyd Wright’s late buildings explored a circular theme. The envelope treatment — layer upon layer of semicircular arches, woven into a roofline that has its own semicircular fringe — is similar to other of Wright’s late works. The dome that caps the structure serves multiple functions. It acts as a traditional church dome, even incorporating the traditional Byzantine blue. Its shallow depth allows it to span an auditorium that seats attendees within easy viewing distance of the pulpit. Finally, it follows a progression throughout Wright’s work wherein he explored organic forms specifically through domes, ellipses and arcs.